For the MY2012, Audi Q7 line adds the S line versions of the 3.0 TFSI and TDI models. The new S line packages includes enhanced design elements, such as lower bumper and door trim in contrast paints, exposed dual exhaust tailpipes with polished tips, and matte Black trim on roof rails and around side windows. The Audi Q7 S-line 3.0 TDI showcases a power output of 333 HP and the torque output of 325 lb-ft, which is 53HP and 30 lb-ft higher than the standard Q7 models. The MSRP for Audi Q7 S line is set to be $59,950. HERNDON, Va., September 1, 2011 — The seven-passenger 2012 Audi Q7 highlightsthe brand attention to details through a host of features that exceed driver andpassenger expectations for functionality and comfort. The premier luxury SUV in the Audi lineup provides impressive carlike handling andfunctional utility for every day driving. New for the Audi Q7 line for 2012 are S line®versions of the 3.0 TFSI® and TDI® models. The new S line package includes enhanced design elements, such as lower bumper and door trim in contrast paints, exposed dualexhaust tailpipes with polished tips, and matte Black trim on roof rails and around sidewindows. A primary highlight for 2012 is the addition of Audi connect™ to the Q7 Audi MMI®Navigation plus system enabling Google Earth™ and Google™ Local Search as well asa rolling Wi-Fi® Hotspot for up to eight passenger devices. 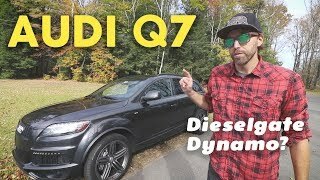 Q7 customers have the option of a gasoline turbocharged, fuel-injected 3.0 liter TFSIengine, or a powerful yet fuel efficient V6 turbocharged direct injection TDI clean dieselengine. Both variants provide more than enough power for city or highway driving andhave the ability to tow up to 5,500 lb (6,600 with the available tow hitch package). With280 hp at 4,920 rpm and 295 lb-ft of torque at 2,250 rpm for the 3.0 TFSI, and 225 hp at3,750 rpm and a whopping 406 lb-ft of torque at 1,750 rpm for the TDI model, the AudiQ7 truly combines power with refined driving dynamics. The higher output 3.0T S lineincreases horsepower to 333. The driver and passengers will appreciate the sense that the Q7 is sure-footed as well,thanks to the latest-generation quattro® permanent all-wheel drive system withasymetric/dynamic torque distribution in a 40/50 split. The eight-speed automatictransmission with Tiptronic® and dynamic shift program adapting to more than 200 shiftprograms delivers smooth shifts and fuel efficient operation. The exterior of the Q7 is athletic and muscular, from the Singleframe® grille andunmistakable LED headlamps to the mirror-mounted blinkers. The design, while visuallyappealing, is practical as well, with a coefficient drag of between 0.35 and 0.37,depending on the suspension choice, to aid fuel efficiency. For all of its power and utility, the Audi Q7 features a luxurious interior designed for apremium driving experience, as well as passenger functionality and comfort. Fromheated and available cooled, twelve-way power front seats, to the fore and aft adjustablerear middle seats for increased legroom as well as the foldable seats in the third rowwith individual cup holders and storage compartments, the Q7 boasts variability and apleasant cabin from all seating positions. This is even more pronounced with theavailable panoramic roof that gives the cabin a lighter, open feeling. Should the heat ofthe sun be too much to bear, pressing a button rolls the electric sunshade across thepanoramic glass to provide shade and minimizing heat entry into the cabin. The 2012 Audi Q7 offers the most advanced Audi technologies to make the motoringexperience intuitive and connected. With Audi connect, the 2012 Audi Q7 models bringthe world of mobile broadband to the car for the first time. Audi connect enables first-to-market Google Earth™ integration, which redefines thenavigation experience. The realistic panoramic views and high-resolution 3D satelliteand aerial imagery provides drivers with a better navigation experience. Audi connectwith Google Earth also improves visual orientation with a “camera zoom” feature thatallows closer views or surroundings or destinations. Added to the high-resolution ofGoogle Earth imagery is an overlay of street mapping data provided through Audi MMI®Navigation plus and real-time traffic information available through a SiriusXM™ Trafficsubscription. Audi connect also provides an industry-first factory vehicle integration of Wi-Fi service.This unprecedented mobile hot spot capability for passengers allows connections for upto eight Wi-Fi capable devices and permits passengers to connect to work or othernetworks. The Google Voice Local Search is also a first in Audi connect and it enables moreintuitive requests for destinations of interest, while also helping drivers to keep theirfocus on the road. With the 2012 Audi Q7 models, destination searches can beaccomplished by voice command, using the innovative Audi MMI touch featuring theinnovative touchpad interface, or by using the system dial. Other features include, real-time information, such as weather, fuel price updates, andstreaming news feeds (available to view when the car is at a stop). The BOSE® Surround Sound System, or the optional Bang & Olufsen® Advanced SoundSystem ensures that all audio is delivered with impeccable sound quality while the Audimusic interface with iPod®/iPhone® connectivity ensures user friendly perusing of playlists and song titles via the Audi MMI system. Safety is a priority with Audi, and the Q7 provides a variety of technologies, such asESC, which is engaged if a dangerous driving situation occurs. A full complement ofairbags, including Sideguard® head curtain airbags for all three rows of seats.. Vehicleconstruction includes reinforced high strength steel / aluminum cross members,reinforced bumpers and rigid body occupant cell to help protect all passengers in theevent of a collision. Destination and delivery charge for all Audi vehicles except R8 models is $875.